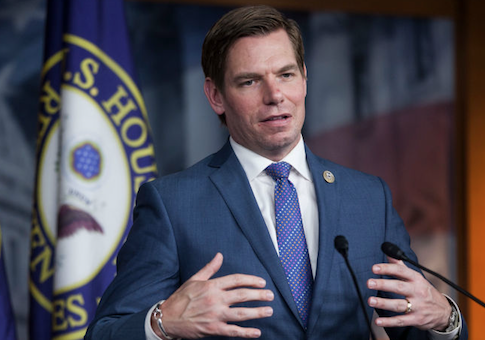 California Representative Eric Swalwell wouldn't rule out a presidential run in 2020. "I'm laying the groundwork right now to win three congressional seats in Iowa … I'm going to make that decision after the midterms." But he adds: "I have a full term coming, my wife's due on December 4," so any decision will come after. At age 37, he'd be one of the younger entrants in the field. Bookmakers in Vegas currently aren't running any odds on Swalwell, but two other California candidates are listed. Senator Kamala Harris is ranked first on the odds maker's boards, generally giving odds between 4/1 and 6/1. Fellow Californian and gubernatorial candidate Gavin Newsom is placed at 7/1 or 8/1, according to oddschecker.com. Newsom is currently the lieutenant governor, and is expected to easily win his contest in November. Currently, the website is listing odds on 44 different potential candidates. As the Washington Free Beacon reported in July, Rep. Adam Schiff's (D., Calif.) leadership PAC appears to be on pace to spend more in the 2018 cycle than it did in the previous six cycles combined. By comparison, CRP data from Swalwell's leadership PAC showed only $17,500 in donations to other candidates so far this cycle.